Samsung X3280 Color Multifunction MultiXpress - Perfecta Business Services, Inc. The MultiXpress X3280 Series A3 color multifunction printer (MFP) delivers exceptional business performance, reliability, and savings. It prints fast with high quality. It’s easy to use and features wireless technologies for convenient mobile printing. Enterprise-level security and a high monthly duty cycle provide reliability. All with the high performance of our MultiXpress X4300 Series office printers, at a lower cost. The MultiXpress X3280 Series offers fast and high quality printing. Boost productivity with the 1 GHz dual-core processor, 2 GB of memory and fast scan speed. Samsung’s unique Rendering Engine for Clean Page (ReCP) technology produces sharp text and clear images on a range of media sizes and weights. A 7” capacitive touchscreen provides intuitive, smartphone-like usability. Active NFC enables easy identification and allows for print-on-tap via smartphone. The 802.11 b/g/n wireless option delivers high-speed mobile printing. And mobile printing is convenient with solutions such as Google Cloud Print, AirPrint, Mopria and Samsung Cloud Print™. Get hassle-free reliability to keep your business up and running. 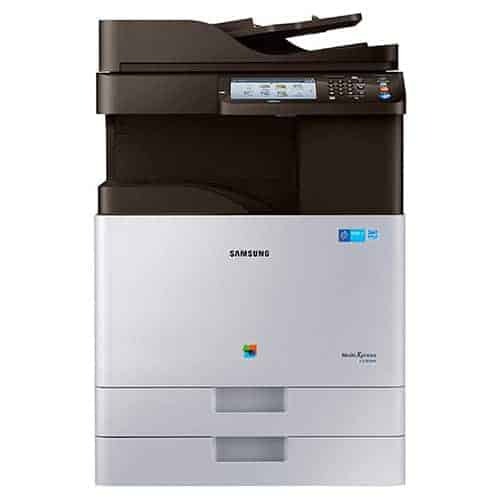 The Samsung Smart Printer Diagnostic System (SPDS) app provides easy on-site printer servicing. A monthly duty cycle of up to 80,000 pages meets the needs of high-volume print operations. And multilayered, enterprise-level print security, including HDD overwrite and data encryption, secures critical business information. Get the high performance and quality of the Samsung MultiXpress X4300 Series at a lower cost with the X3280 Series. Shared options and service parts with the X4300 Series, such as Punch Kit, Fax, Dual Cassette Feeder, Stand, Wireless/NFC, Developer Unit (Mono), Tray and Roller and more, help to reduce service and replacement costs. The X3280 Series supports authentication through 802.1x, Simple Mail Transfer Protocol (SMTP), Lightweight Direct Access Protocol (LDAP) and Kerberos technologies, along with network use authentication at the control panel. Enable administrators to lock or disable the control panel and restrict direct printing, access to the address book and the USB port.